Pulse that up until your mixture resembles coarse crumbs, then dump the dough out onto a piece of plastic wrap and wrap it all up, patting it into a thick square. 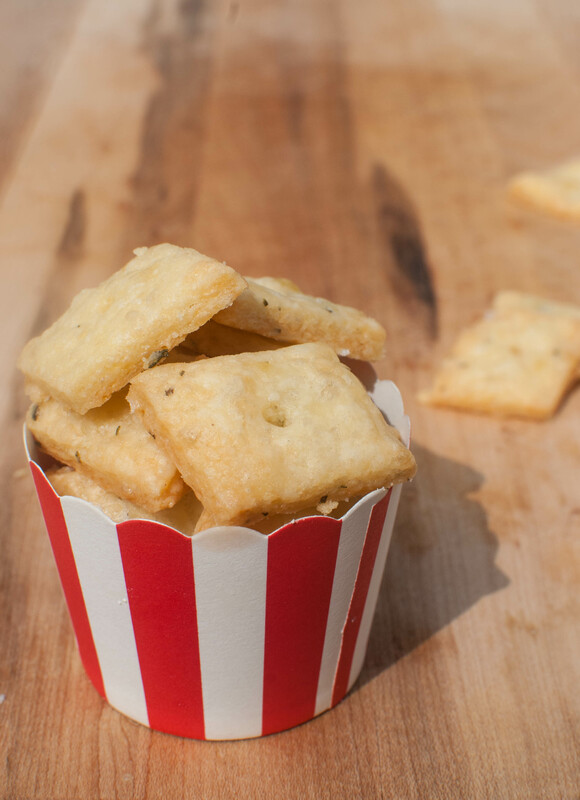 Pop it in the fridge for 15 minutes while you preheat your oven to 350! Now comes the trickiest part–rolling. My dough was extremely crumbly, but stick with it because it’ll all turn out okay. I promise! Knead the dough a little to try to incorporate all of the floury bits, then start rolling it out on a lightly floured surface. You may get some cracks, but as it warms up a little you should be able to get it to about 1/8-inch thick. Use a pizza roller to cut diagonal strips one way, then the other to form diamonds. 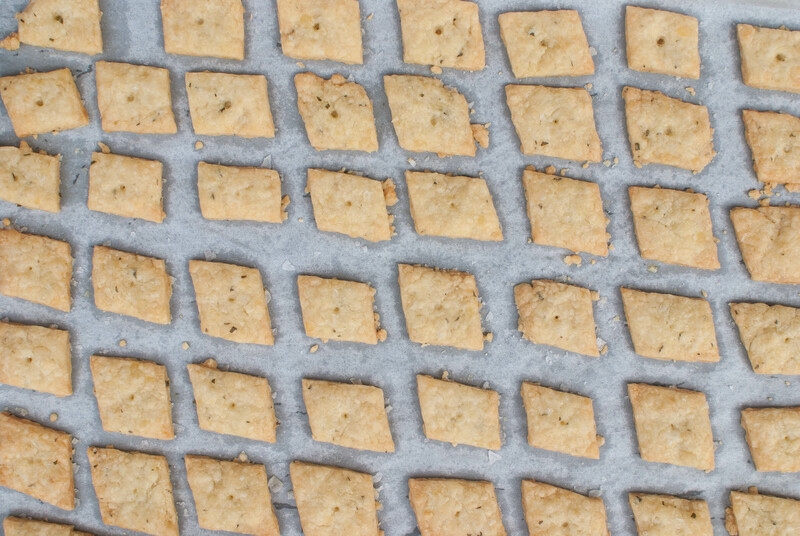 Use a metal spatula to transfer the crackers to a parchment-lined baking sheet. Next, use a toothpick to poke holes in the center of each cracker, then use your finger to dab each one with a teeny bit of water. Finish ’em off with a sprinkling of sea salt and throw them in the oven! Oooh yum. 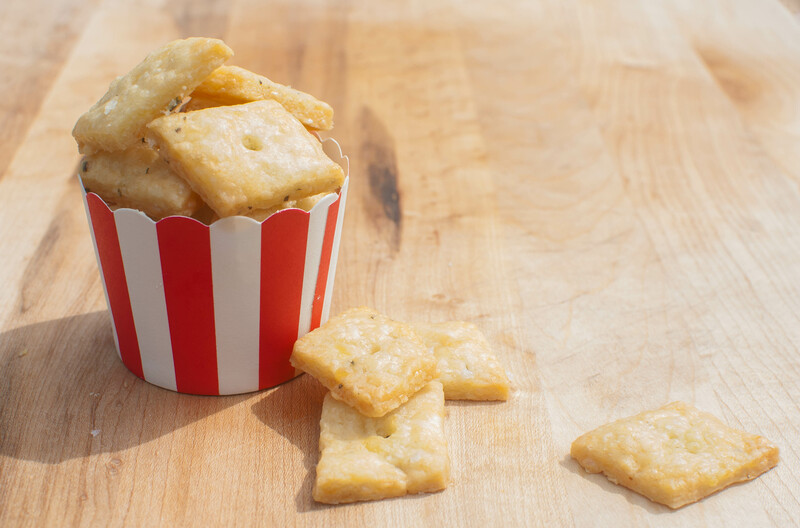 Bake for 10-12 minutes, or until this golden brown perfection happens. Serve ’em up! These’ll go fast, trust me. 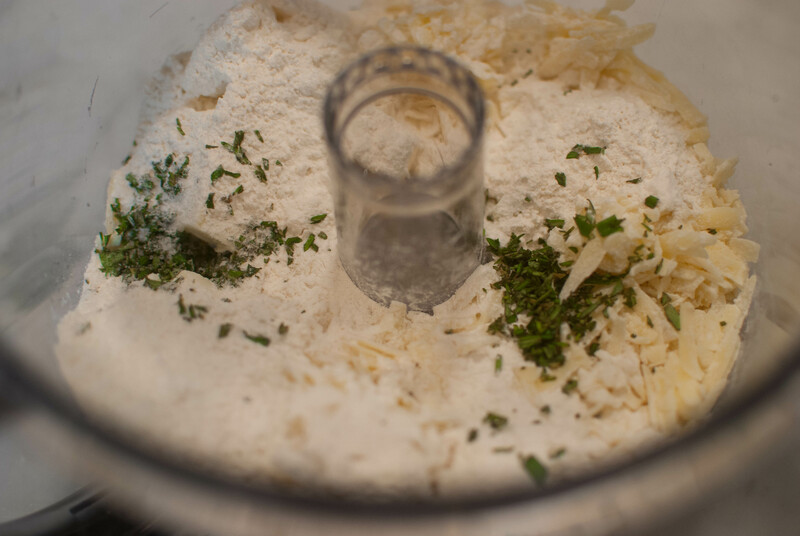 Place all ingredients into the bowl of a food processor (or a large bowl if using a pastry cutter). 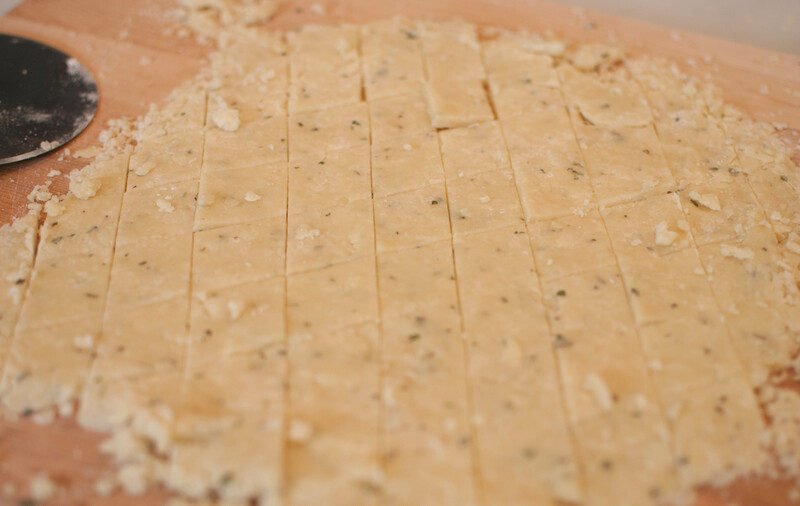 Pulse (or cut) until your mixture resembles coarse crumbs, then dump the dough out onto a piece of plastic wrap and wrap it all up, patting it into a thick square. Place in the fridge for 15 minutes while you preheat your oven to 350 F.
Knead the dough a little to try to incorporate all of the floury bits, then start rolling it out on a lightly floured surface. You may get some cracks, but as it warms up a little you should be able to get it to about 1/8-inch thick. Use a pizza roller to cut diagonal strips one way, then the other to form diamonds. 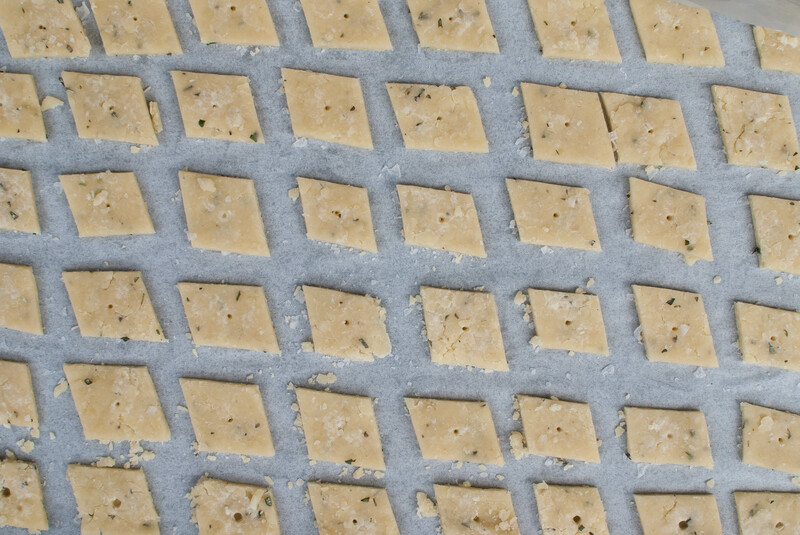 Use a metal spatula to transfer the crackers to a parchment-lined baking sheet. Next, use a toothpick to poke holes in the center of each cracker, then use your finger to dab each one with a teeny bit of water. Finish them off with a sprinkling of sea salt and bake for 10-12 minutes, or until golden. Serve to your friends and family or eat them all up yourself!